Pure silk takes sleepwear from ordinary to divine. Particularly when it is a rare silk knit that stretches and moves with your body. This is the sleepwear you didn’t know you were looking for! Silk is a premium, wholly natural, fibre. The soft, smooth handle of the fabric feels utterly luxurious against your skin and pampers for the third of your life you spend asleep. It is beautiful, durable and highly breathable, releasing excess heat and moisture to keep you comfortable all night long. New Silk Sleepwear Separates from www.nznature.co.nz offer supreme style, comfort and versatility. Choose a nightie, or matching PJ Pants and a Top, from the range, or match one piece with something you may already have. We have one Silk Sleepwear Separates PJ Pants and Top to give away, valued at over $210. Do you prefer a summer or winter Christmas and why? To enter, individuals must, during the competition period, visit www.mindfood.com follow the prompts on the competition entry page, input the requested details including the answer in 25 words or less to the following question “Do you prefer a summer or winter Christmas and why?” and submit the fully completed entry form. Competition commences on 02/11/2018 AEST. Entries close 10pm on 20/11/2018 AEST. The judging will take place at McHugh Media Australia Pty Ltd, 102/4-14 Buckingham Street Surry Hills NSW 2010 on 21/11/2018 by 12pm AEST. Winners will be notified by email. The Promoter’s decision is final and no correspondence will be entered into. 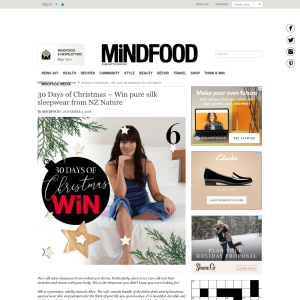 The Promoter has one pure silk PJ set from NZ Nature to give away, valued at $210. Total prize value is $210. Prizes are not transferable or exchangeable and cannot be taken as cash.